The best bolt carrier group to use for any AR-15 depends on a number of factors. Not the least of which is the intended purpose of the weapon followed closely by your budget, firing frequency, and aesthetic appeal. However, before we delve into the minutiae, lets first understand exactly what a bolt carrier group is and the duties it performs. Just What Is the Purpose of a Bolt Carrier Group? 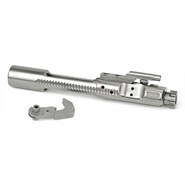 The major parts the bolt carrier group houses are the bolt, gas key, firing pin, extractor, and cam pin. The unit, as a whole, sits inside the upper receiver. Its job is to chamber a fresh round, cycle the guns “action”, eject the empty brass, and reset the hammer all during one cycle. The BCG is easily the most critical component that decides whether a weapon is reliable and could be considered the heart and soul of the weapon. 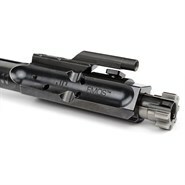 The BCG, along with the buffer, creates the mass required to cycle the action of the gun as well as determining the degree of muzzle rise and recoil you experience. There are three main BCG designs, the M-16, AR-15 and Lightweight. M16 and AR-15 style are brothers, however, each has its own purpose. The M-16 version is heavier and has a longer, full-size rear section. Its increased mass remains in battery a bit longer and is designed to withstand the rigors of fully automatic fire and match grade guns. 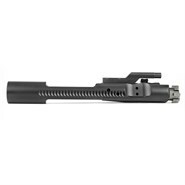 The AR-15 style BCG is designed for semi-auto fire and cycles faster than its heavier counterpart. Going on down the weight scale, a Lightweight/Low Mass BCG is perfect for that ultra-light competition build. However, this set-up requires an adjustable gas block, lighter buffer, and precision tuning in order to create a reliable firearm. 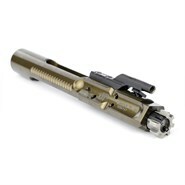 Why Upgrade to The Best Bolt Carrier Group at All? Improved Reliability - A heavier steel BCG increases the guns cycle time and reduces the stress on the spent brass, this is a benefit to those who reload. It results in a combination better able to digest a variety of ammunition with minimal adjustment. 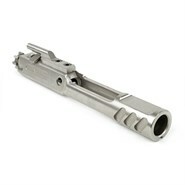 A steel BCG is commonly used by the military and law enforcement to combat the large number of rounds fired. Improved Durability - The use of titanium or one of the available coated/plated carriers could be an asset. Titanium is lighter and stronger than steel. Therefore, it is better capable of withstanding higher heat and the extreme pressures found in hotter loads. Titanium is the most expensive material and the toughest to machine, therefore, its production is the most costly. 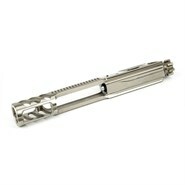 A coated/plated BCG has a slicker surface and is much easier to clean, often requiring nothing more than simply a cloth. 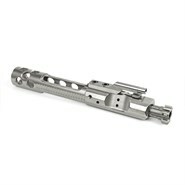 Increased Speed - A lightweight BCG made from titanium or anodized aluminum decreases its weight and mass. Therefore, the gun will cycle faster and you will get a faster rate of semi-auto fire. Along with control, gained through practice, this could prove beneficial in fast-paced competition. Improved Action Smoothness - Using a light-weight BCG combined with a compatible buffer will give a lighter, smoother cycling action. If combined with advance coatings such as Nickel Boron, Diamond-Like Carbon coating, or Black Nitride, you will enjoy a slicker surface and reduced friction, thus creating a smoother action. Below we have amassed a list of the 10 best-rated bolt carrier groups and review of each. This top-rated AR-15 bolt carrier group is a drop-in replacement for your weapon. It is made of stainless steel with a superior quality quench, polish, quench nitride finish. Therefore, it gives increased lubricity and hardness along with enhanced corrosion resistance. Featuring extended forward assist serrations and a dust cover notch this bolt carrier group offers increased versatility and performance. All of its sharp edges are radiused and its bearing surfaces are increased 100% for smoother operation and longer life. When properly lubricated this high-quality will make your AR-15 run like chained lightning. 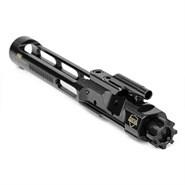 This is considered to be the best AR BCG by many and does not disappoint on any level. Along with this carrier comes years of shooting and engineering experience giving you every advantage of a Mil-Spec part and much more. 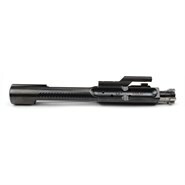 The superior design comes together with an impeccable finish to produce a flawless bolt carrier group. With its incredible engineering and high-quality this could easily be considered one of the best AR-15 bolt carrier groups on the market. These are available as just a carrier or a complete bolt carrier group that includes the JP Enterprises AR-15 Enhanced Bolt Assembly. 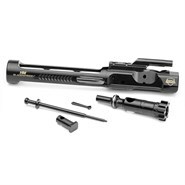 Being easier to clean and yielding superior accuracy than your standard Mil-Spec part makes choosing the JP Enterprises Full Mass Bolt Carrier Group easy. 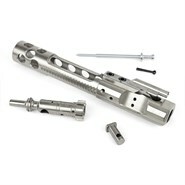 Rubber City Armory brings you the best rated AR-15 bolt carrier group you could want at a price you will not believe. 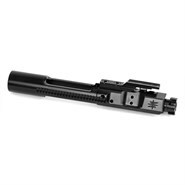 This Blacknitride+ M16 bolt carrier group is designed for use in a fully automatic M16. Yet, it will drop into and run beautifully in your Semi-Auto AR-15. If you're not licensed to own that kind of weapon don’t worry. It takes more than just a bolt carrier group to change over to full auto, you will still be firing semi-auto and fully legal with this new carrier. 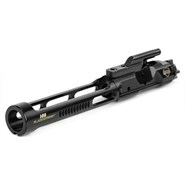 This is the best AR BCG to sport a Blacknitride+ finish inside and out, resulting in a super hard surface with increased corrosion resistance that requires less lubrication than other inferior parts. 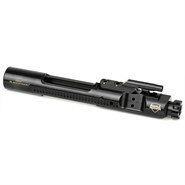 This is one of the best BCG for AR15 that’s full-size and fully automatic rated you can find. With its enhanced features, you can now enjoy the same reliability and performance enjoyed by law enforcement and security professionals without breaking the bank. 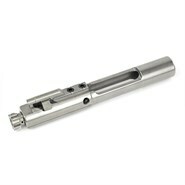 The attention to detail shows all the way from its precision machining right down to its gas key that is always staked. Every Rubber City Armory bolt Carrier Group sells is 100% inspected and made in the USA. 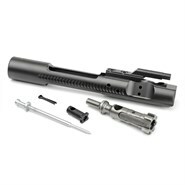 Seekins Precision Melonite NX15 is a top-rated AR-15 bolt carrier group and a bargain for the price. 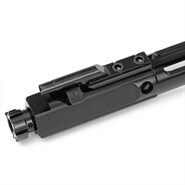 Whether you’re looking for a drop-in Mil-Spec quality replacement for your current workhorse or are going for a new build, this bolt carrier group demands consideration. Seekins Precision doesn’t simply build parts, they use unrivaled innovation to solve problems for the firearms community. They quietly sit up in Idaho building the American dream, one piece at a time. 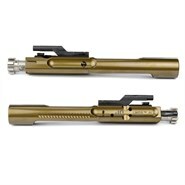 You’ll find this product to be one of the best-rated AR-15 bolt carrier groups to sport a Melonite finish. Melonite is a quench, polish, quench nitride process resulting in a super-hard, durable, slick surface that is better than chrome. Instead of adding a layer, melonite alters the structure of the steel, both at and below the surface. This results in more precise dimension control, increasing consistency and accuracy. This bolt carrier group is full auto rated and goes through an in-depth magnetic particle inspection process that guarantees a finished product that is flawless. The Melonite NX15 is durable, reliable, smooth, and waiting patiently to go to work in your AR-15. 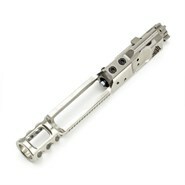 Another top-rated AR-15 bolt carrier group comes from WMD Guns with their NiB-X Nickel Boron offering. It can be had in a Mil-Spec full-auto or semi-auto version, with or without a hammer. Either one will legally drop-in your AR-15 upper and run without fail. The WMD proprietary NIB-X Nickel Boron finish is strong, reliable, corrosion resistant, and extremely smooth. It prevents carbon fouling from sticking, therefore, it’s very easy to clean. 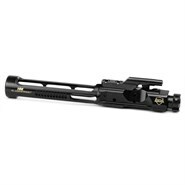 By having this finish, it provides the best BCG for AR15 high volume fire rates, especially when suppressed or run in a short-barreled set-up. The WMD Guns NiB-X Nickel Boron bolt carrier group has to pass a stringent Magnetic Particle Inspection before it can wear the WMD brand. This procedure will detect the most minute flaw, even below the surface. So, when you get your hands on one you know you have a high-quality bolt carrier group. Even its gas key is crafted from tool steel and properly staked with Grade 8 hardened fasteners, not Locktite, so, you can be certain it will stay where it’s supposed to. With a WMD part, you can expect no less than the best. Have you ever asked yourself what if I could have the best AR-15 bolt carrier group that will deliver competition quality and performance at a reasonable price? Well, you can, it’s here, and we have it. 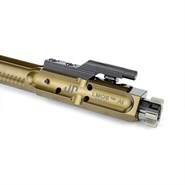 It comes in a nice tight package called the Iron City Rifle Works S1 Bolt Carrier Group. It’s been said for years that you can run an AR-15 dirty, but you can’t run it dry. Instead of just continuing the standard practice of spraying oil at the problem, Iron City addressed the problem. They tasked their engineers to come up with a chemical coating that when applied to the surface of the metal it would behave like a lubricant but never wear off. The solution came with the EVO Gen2 NiB finish. The improved Nickle Boron treatment turned out to be harder, stronger, and have a lower coefficient of friction than traditional Nickle Boron. This best-rated AR-15 bolt carrier group has a surface that is extremely slick and very resistant to carbon fouling. What carbon that does cling, easily cleans away with a wipe. So, if you want a very reliable, competition quality bolt carrier group, the Iron City Rifle Works S1 deserves a look. 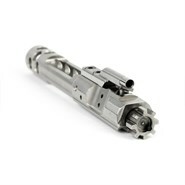 When you want high-speed performance, you have to absolutely go to the heart of the matter, the bolt carrier group. 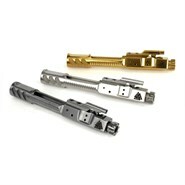 One of the best lightweight AR-15 bolt carrier groups to be had comes from JP Enterprises. This one is not meant for self-defense or duty, if that’s what you want, you need to stick with battle proven systems. 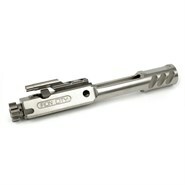 However, if you want a competition race-gun, this could be the best lightweight bolt carrier group for you to use. Especially for the 3-gun rip and grip world of competition, it will help you improve your game. However, just like putting high-octane gas in your daily driver won’t make it a race car. You’ll need more than just this BCG to make your AR a race gun. But, when you combine a high-performance BCG with the right compensator, an adjustable gas block, and buffer set-up you will have one. A properly tuned gas system along with this Aluminum JP Enterprises BCG will give you less recoil, less muzzle rise, and faster recovery. More shots on target mean you score just might go up as well. 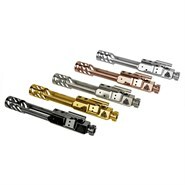 When you want to increase cycle rates and performance while keeping reliability you need the best lightweight AR-15 bolt carrier group you can find. Well, you’ve found it, it’s the Iron City Works G2 Enhanced bolt carrier group. While it is lightweight, it’s made of steel and that means it’s durable and reliable. Granted, a bit of the carrier has been machined away in non-critical areas for weight reduction, it definitely has a wow factor. This bolt carrier group is so striking you’ll wish that your upper was transparent so you could show it off. 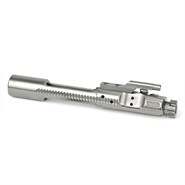 Welcome to the next generation of competition bolt carrier groups. Beautiful as it may be, it’s built to last. Standing out as the best lightweight bolt carrier group available doesn’t mean that it cuts corners on performance. Iron City gave this BCG a finish delivering better heat resistance and less coefficient of friction than the traditional Nickel Boron finish. Take a look at the top and see the gas key has been seriously staked, as it should always be. Also, every millimeter has to pass a tough magnetic particle inspection to get it ready for you to run it through the mill. Your bolt carrier group is the workhorse riding inside your upper that will make or break your day. In competition speed is good, however, it doesn’t mean much without a durable, reliable part. That’s where the RCA low mass competition AR-15 bolt carrier group shines. 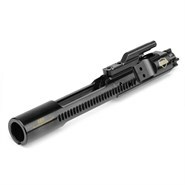 It is among the top-rated bolt carrier groups that can be had. It wears the Blacknitride+ Enhanced finish which looks good and wears even better. This finish not only hardens the steel and improves its corrosion resistance, but it also serves as a built-in lubricant. Therefore, the guns cycle rate goes up as the carbon fouling goes down. 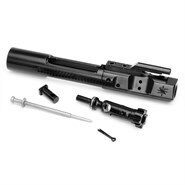 Everything combined means this bolt carrier group is going to run longer without issues. 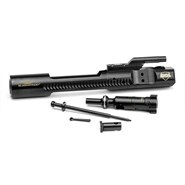 It is considered to be the best-rated AR-15 bolt carrier group that is designed to drop right into either your existing upper or finish off that new build. Do remember that when you change the weight of the carrier you change the mass as well. So, to realize the true benefits of this Rubber City Arms upgrade you have to go a bit further. You have to mate this BCG with a good adjustable gas block and buffer system in order to match the mass of the bolt carrier group. Put it all together and you get less recoil, less muzzle rise, therefore, you can keep your eyes on the prize. When you’re in the market for the best lightweight AR-15 bolt carrier group on the market, take a look at Spike’s Tactical M16 Nickel Boron Bolt Carrier Group. 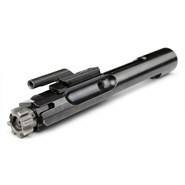 The bolt carrier group is one of the most mission-critical components of your weapon. Therefore, it would be silly to go cheap and opt for second best or worse than that some imitation from overseas. 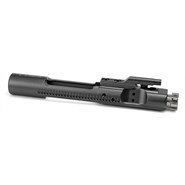 This is about the best low mass AR BCG available in the full-auto M16 profile. 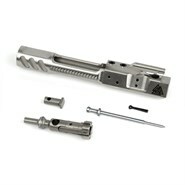 It’s an easy drop and swap into your M16 or AR15 and will run flawlessly in either full-auto or semi-auto mode. 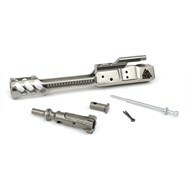 Just like any M16 rated bolt carrier group you will find a shrouded firing pin inside. Many shooters swear by this design because the M16 style shrouded firing pin is not likely to puncture your primers, as you can imagine, blowouts are no fun. 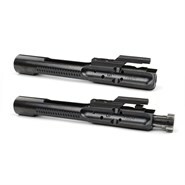 This top-rated bolt carrier group is Nickle Boron coated inside and out. It provides a finish that is smoother than chrome ever dared to be, that will never chip, peel, or flake away. I wouldn’t be surprised if you looked up slick in the dictionary and it said: “see Spikes Tactical Nickel Boron Bolt Carrier Group”. This BCG comes with Spikes Tactical Lifetime Warranty that was earned, not given. 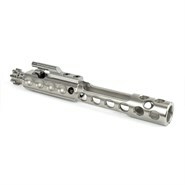 It’s a good-looking, hard-working BCG that you will be proud to own. When you want to be your best, you have to have the best. There's nothing more crucial to the performance of your AR-15 than the bolt carrier group. 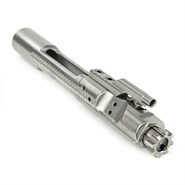 And, if you want the best bolt carrier group working for you, then you're going to want the V Seven Titanium BCG. I know, at first blush the price might make you say hmm. However, there’s a huge difference between price and cost. If you pay an initial price for a quality item that will perform well and last a lifetime that’s one number. Opt for something that’s cheaper and save a few bucks and then, guess what? Another number comes into play. The part will prematurely fail and you lose not only the initial price of the part, but you also lose your time and the cost to replace that inferior part. That’s the real cost of a bad choice. 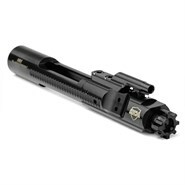 The V Seven Titanium BCG is the best AR-15 bolt carrier group that you’re going to find. It’s lighter than steel and stronger than either steel or aluminum. It’s both Magnetic Particle Inspected and High-Pressure Tested, pass those and you’re the best of the best. Also, the V Seven comes in full-auto rated M16 design that will run great either in a full-auto or a semi-auto gun. Add a lifetime warranty to all of that and suddenly the price is right. 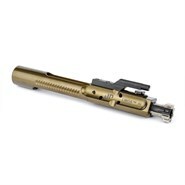 What really matters is that you find the best AR-15 bolt carrier group to fit your needs. God only knows that if you keep shooting to any degree, this BCG you order today won’t be your last. That’s not because the BCG won’t last, more directly, you know you will buy or build more weapons, and that is how it should be. Send us an email here at Wing Tactical, and we will make sure that you get what you need, this time and every time. The best colt carrier group for one person just might be terrible for another. The self-defense, on-duty, or military gun needs to be very dependable. Whereas a rifle used in three-gun competition can bear more severe modification. Whether your shooting habits are simply a box or two of shells a month, or you run through thousands of rounds makes a difference in which is the best bolt carrier group for you. If you’re looking to upgrading your BCG, take a look at the large number of bolt carrier group Wing Tactical has to offer and pick out the one that’s right for your needs today.